World Movie Series - 21 - Dayereh ~ Scorp's Say ....! For the first time, saw an Iranian film, and it was again due to reading an article in ‘Alainthu tiribavanin Azhagiyal’ by Charu. He has written about the films from Muslim countries, and hence, bought some good films from Iran and Afghanistan. Yesterday, saw this film, and to be frank, it’s good and touched my heart. The director Jafar Panahi is an acclaimed director from Iran and has directed good movies like ‘The white balloon’ and ‘The Mirror’. It’s to be noted that while this film was being screened in the U.S, Panahi was arrested at the JFK airport, New York in 2001 for not possessing a transit visa. Although it was not needed, he was arrested mainly since he was a Muslim and was handcuffed and leg-chained and detained in the airport for ten hours along with some other passengers. He refused to submit to a finger printing process and was not allowed to call anyone. Finally, at the end of the ten hours, he was allowed to make a call and as a result proved his identity and even then, was sent back to Hong-Kong, dragged to the flight all the way handcuffed and chained. Ironically, he was presented the ‘Freedom of expression’ award by the US national board of review of motion pictures. He rejected the award sending a letter to the board, but the letter was not published in any major U.S newspaper. Read Jafar Panahi’s statement of protest – his letter to the board at this link. 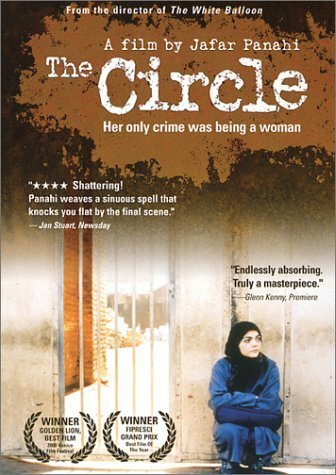 Now, ‘The Circle’ is about three different stories. Or rather, three different agonies suffered by the woman of Iran. It showcases the oppression on Iranian women by the government and the so called ‘strict’ rules inflicted on women. It clearly tells us about how stupid these rules are and how painful it is to be a woman in Iran. The film begins at a hospital. 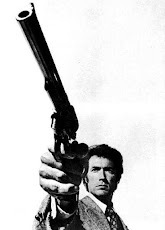 We hear the agonizing wails of a woman, and soon, we also hear the cries of a baby. The nurse calls the woman’s mother and tells her it’s a girl. The old lady appears startled, and again re-confirms that it’s a girl child. She hurries to her another daughter and tells she doesn’t know what to do, as all the in-laws were expecting a male child, and the girl child will die surely. She orders her daughter to go tell this news to her relatives, as we hear at the background the in-laws fighting with the nurse. While the girl hurries on the road, we see three women; two of them are called Nargess and Arezou. We learn that they have escaped from the prison and are planning to go to the native village of Nargess. While Nargess gives her gold chain to the third girl to sell it for money, she gets caught by the police and is taken back to custody. Nargess and Arezou now are left with no money. Arezou somehow is able to get some money and she takes Nargess to the bus station. Arezou refuses to go to the village, as she tells she does not want to shatter her own dreams that it will all be sunshine and rainbows in the village. 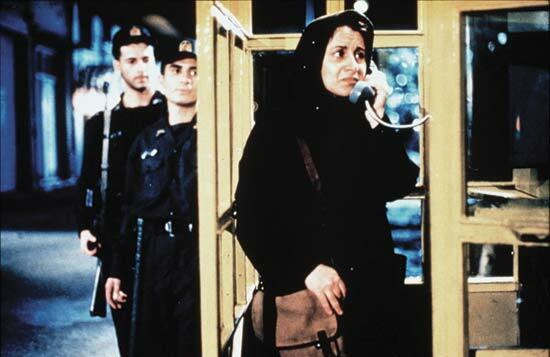 Nargess buys a ticket for the village, but is unable to get in to the bus, as the passengers are frisked by the police. She runs away from the station to the house of another prisoner who escaped along with them, Pari. At Pari’s house, her parents drive Nargess away asking her not to come there again. Pari escapes from the house, and she runs to a friend of her, Elham, who was her former prison mate, and now is the wife of a doctor, obviously having hid has past from the doctor. Pari tells Elham she needs an abortion, as her fiancée was executed in the prison and the baby is now four months old. She tells she has tried numerous ways but everywhere they are asking for the papers and her id. Pari pleads Elham to help her out, as her husband himself is a doctor. Elham is reluctant to help Pari as she is concerned more about her past. If she helps Pari, then her husband will get to know about her past and will divorce her. Hence she says she cannot help Pari, and a disgruntled Pari leaves the place. Since Pari doesn’t have an id, she cannot stay in any hotel. She is left marooned on the streets, and as she is roaming, she sees a lady with a baby girl. The mother tries to abandon the girl as the baby will get a better future that way. Now, after talking to the lady, Pari runs away. The mother, after seeing her child taken care by the police, starts to walk in the road, and gets in to a car when a person asks her whether she is interested for the night. As they travel, he stops the car at a check post and we realize that he is a police too, and he doesn’t like women hitchhiking in cars, for prostitution. We see a man begging this guy to be freed, as he was with a prostitute in his car. While the police man investigates that person, the mother runs away from the place. They arrest the prostitute and ask her to get in to a wan. This prostitute is a very bold woman, as she casually lights her cigarette inside. She is very relaxed and is calm. At the prison, the police ask her to go in to a lockup, where we find all the women we saw from the beginning of the film. A guard comes and asks for a woman named Solmaz Gholami, the woman who gave birth to a baby girl at the beginning, and the film ends with this shot. 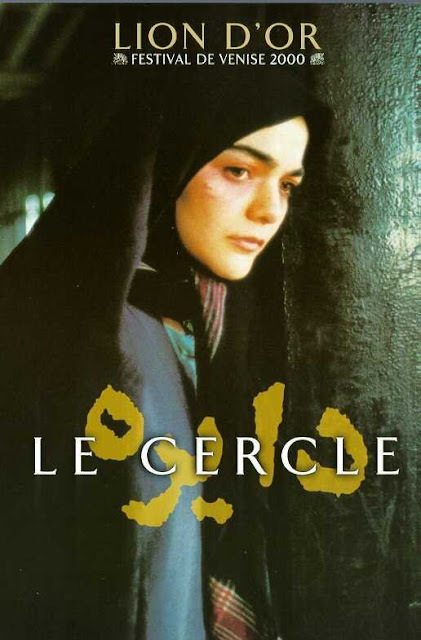 The Circle is a film which talks firmly about the Iranian government’s prejudiced rules on women and has won the Golden Lion at the Venice film festival in 2000. It has been banned in Iran, though. We see in some scenes that the women have to wear a ‘Chador’ (the long cloak used to cover the head and the body). Also, the women are not permitted to go alone without a man anywhere. All the rules in Iran are favorable towards men and have completely abandoned the women. There is not even a hint of background music in this film totally! I was amazed to see that the lack of music has indeed helped the movie tremendously, as the movie has been filmed in a documentary like fashion. For the entire duration, the camera follows the women intently and there are no artificial shots or cuts or any kind of gimmicks. Almost all the characters, except two, are amateurs. Another thing I noted is that all the women are in want of cigarettes, and almost all the women have been arrested at least once in Iran. But they seem not to care about this. Also, as Charu writes, the police arrive in almost all the scenes and the women are afraid about the police. Seeing this film, we realize women are treated in the same way throughout the world. Everywhere they go, they are imposed with some stupid and strict rules on them. The women are losing their happiness and independence ubiquitously. The Circle stands as an example to highlight the fact. Have seen two iranian films (children of heaven & colour of Paradise)both were excellent..u can have a try..and u have good touch with the pen / keyboard. Good work...keep it Up..
u can also get some good movies list from www.sramakrishnan.com; by the way can u let me know from i can get these movies in chennai. Thanx for suggesting two great movies Myil. . I've mailed to u.. I'l try seeing colour of paradise soon..
Charu Nivedita - The rebel with a cause . .
Trailers are now available . .
World Movie Series - 15 - Salaam Bombay!